"Chalcedony (Chalcey) is too busy planning the launch of her dance studio to fret about the absence of men in her life. Besides, she's hanging out for the man of her dreams - if such a creature exists. Her ordered world is turned on its head when she's given a wulfenite crystal, ... read full description below. Chalcedony (Chalcey) is too busy planning the launch of her dance studio to fret about the absence of men in her life. Besides, she's hanging out for the man of her dreams-if such a creature exists. Her ordered world is turned on its head when she's given a wulfenite crystal, and Lord Wulfenite, Keeper of the Shifting Sands fief, emerges... and kisses her like there's no tomorrow. Before they comprehend what's truly at stake, Chalcey has bonded with Wulf and his life is in her hands. And with the Crystal Guardian's final test looming, Chalcey must confront her feelings for Wulf... and find a way to save him before it's too late. Maree Anderson writes paranormal romance, speculative fiction romance, fantasy, and young adult books. She lives in beautiful New Zealand, home to a number of hobbits and elves. She's the mother of two teenagers, and she's partial to chocolate, coffee, Ceroc dancing and reading... not necessarily in that order. 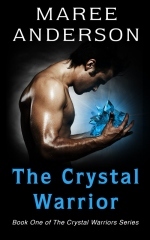 The Crystal Warrior is the first book in her Crystal Warriors paranormal romance series. Other books in the series include: Ruby's Dream, Jade's Choice, and Opal's Wish.